Your credit card will be charged for the full amount of your booking at the time the reservation is made. This payment will be taken via our secure Payment Express Facility. No refunds are permitted on accommodation bookings. In the case where cancellation or amendment of a booking is required, the full quoted amount of the reservation will be charged. Guests requiring alternative accommodation dates will need to rebook, no amendments/transfers permitted. A maximum of 2 rooms can be booked on Stay & Save rates. Please note these Stay & Save rates are not valid for events & conferences. 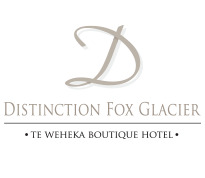 Check in time is 2pm at Distinction Fox Glacier Te Weheka Hotel, 15 Main Road, Fox Glacier. If earlier check in time is required please request this at the time of booking.